Childhood is defined in different preconceived manners by different discourses. Thus the categories defined by age such as infant, child, adolescent and so on, are to some extent arbitrary divisions that are subject to the evolution in clinical, societal, ideological and political discourses. Within psychoanalysis there has been a conflation of childhood construed through the retrospective memories of adults, and childhood as seen through the perspective of infant observations. In What is a Child? the author argues that the place of the child as subject in the fullest sense has been neglected through these tendencies, and that such confusion has marked the history of the psychoanalysis of the child itself, which began as a family affair. 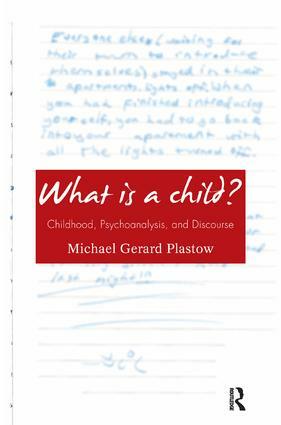 In this book, the author endeavours to tease out the different notions of time and history that are implicit in the history of child psychoanalysis and in the clinical approach to childhood. He closely examines the beginnings of psychoanalysis of the child, particularly emphasising the contributions of Hermine Hug-Hellmuth. It was she who emphasised the impossibility for parents to analyse their own children.